The UDF is much faster than repeated use of the Goal-Seek command. 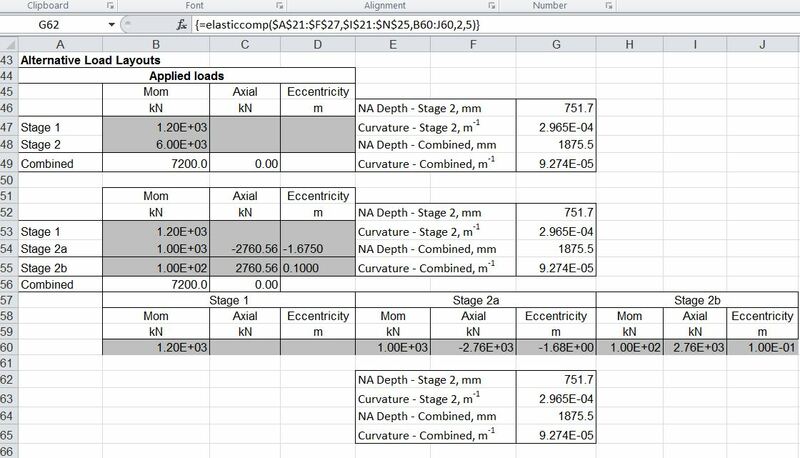 The UDF is much more flexible, for instance allowing the analysis to be performed at a series of sections along a beam, with the load information in tabular format. The new spreadsheet may be downloaded from Composite Design Functions . As usual, the download file includes full open source code. The main ElasticComp function calls the QuadBrent function with “FindCurve” as the target function. FindCurve adjusts the section curvature with a constant Neutral Axis depth so that the resultant bending moment on the section is equal to the applied load. For each iteration of the FindCurve function the QuadBrent function is called again with “EvalForceMom” as the target function. This function adjusts the top-face strain, with constant curvature so that the resultant axial force on the section is equal to the applied load. This process is repeated until both bending moment and axial force are equal to the applied loads, within the specified tolerance. This entry was posted in Beam Bending, Concrete, Excel, Newton, UDFs, VBA and tagged Brents method, composite concrete beam, Excel, Prestressed concrete, Reinforced Concrete, UDF, VBA. Bookmark the permalink. I’m using the VBA/UDF spreadsheet exactly as downloaded including section properties and loads, except that I’ve changed the array formulas starting in cells L9 & M9 of the output sheet to refer to L7/M7 instead of blank cells L24/M24. Could you please explain what results are being shown by cells L9:L11 and M9:M11. If I calculate eg an ‘implied area’ of super-tee flange reinf = (M9*1000/L9) =1417 sq.mm, but the actual area of the super-tee flange reinf is 2011 sq.mm (10-N16). The bottom prestressing areas also don’t tally. Also, the stress reported by cell L10 is 6.5 MPa. I assume this is for the upper layer of prestressing. I’d expect this to be 63.6 MPa by proportioning from the bottom layer stress of 69.7 MPa. Yes, there is something not right there. Based, on Force/Stress x 1000,the top steel area is 1658.8 mm2, but that’s the effective area, allowing for displaced concrete. Dividing by (1- 35/200) (1 – Econc/Esteel) gives 2010.6 mm2. Thanks for pointing that out. I’ll update the composite beam spreadsheet as soon as I have time.